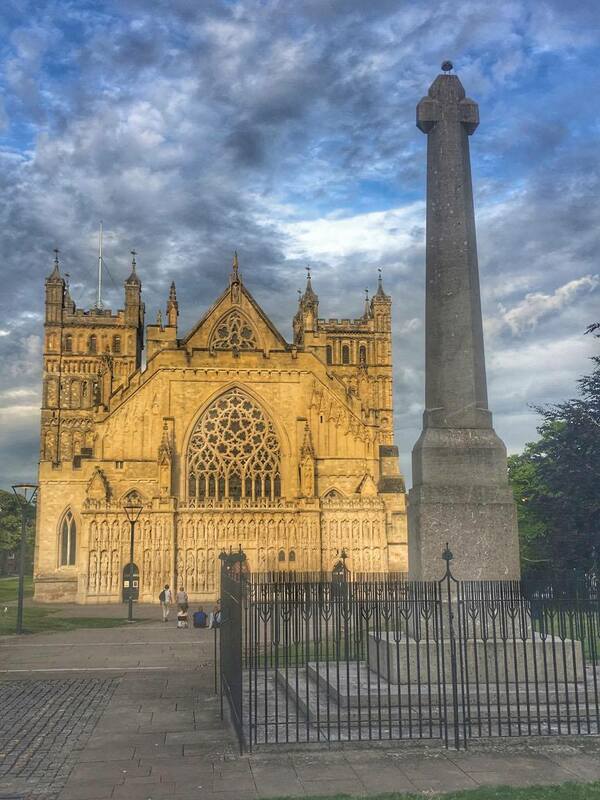 In June and July 2018, Julia Hopkin, an MA student in experimental archaeology at Exeter, spent some time in Exeter Cathedral Library and Archives, funded by the university as part of the College of Humanities’ student internship scheme. Her job was to create a guide for students (at all levels) who might be interested in using the Library and Archives for research. Here she talks about her experience. 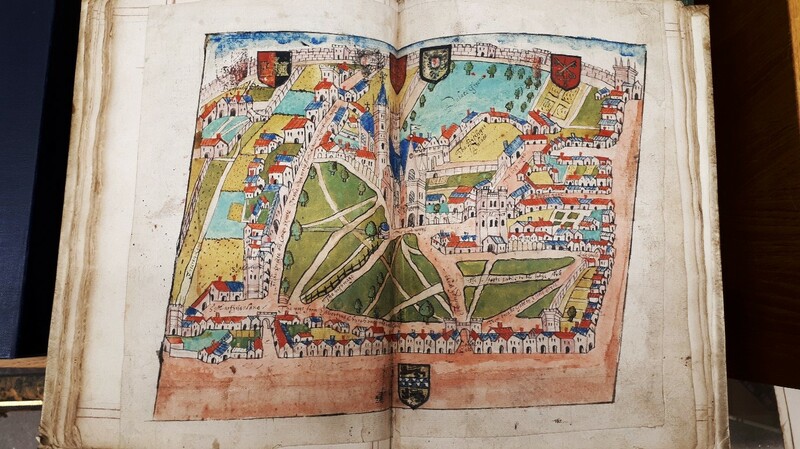 We’ll be putting copies of the guide on the module webpages for the History dissertations other modules but otherwise for a copy please contact Catherine Rider (c.r.rider@exeter.ac.uk). 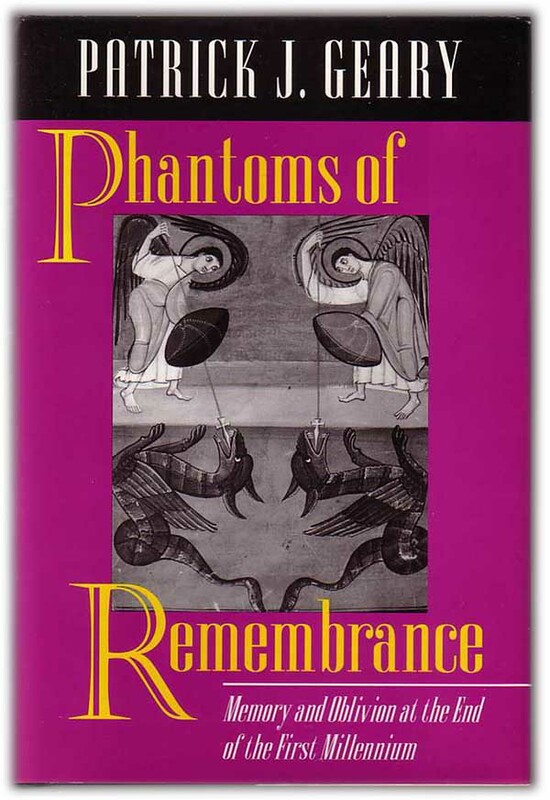 For more information on the Cathedral Library and Archives see their website. Most people are completely unaware that Exeter Cathedral has a library or an archives, and to those unfamiliar with it, it might sound like a rather intimidating place, full of dust and uninspiring tomes. These ideas couldn’t be further from my experiences there and in my recent role putting together a guide to the Library and Archives’ collections, my aim was to debunk some of these misconceptions and make the extensive collections as accessible and unintimidating as possible, especially to students who may not have much experience with research outside the university. 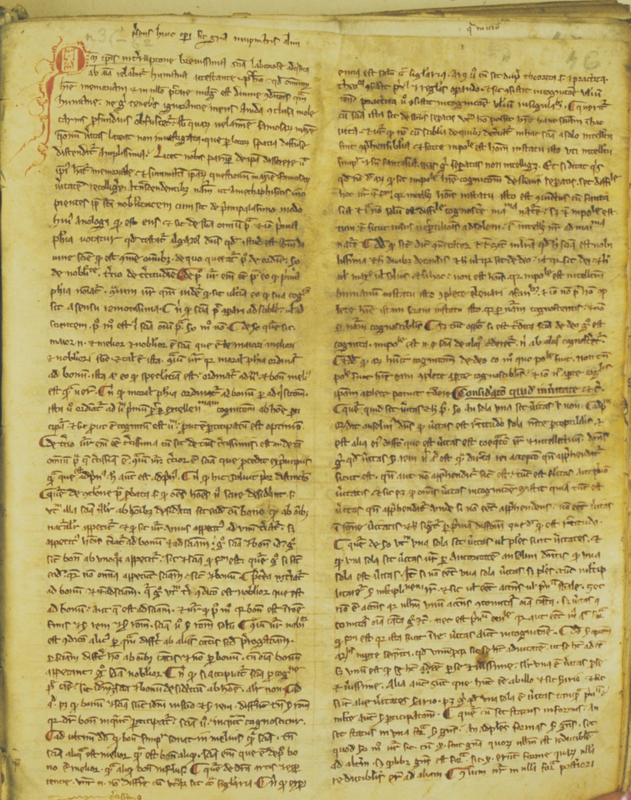 The earliest contributions to the library date to the mid eleventh century, with the first books brought to the Cathedral by Bishop Leofric in 1050, and the archival documents have been accumulating from around the same time. Records and acquisitions in both areas are ongoing, and the topics covered by the material are almost bewildering in their scope. 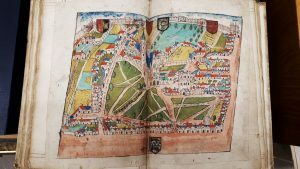 This makes them a gold mine for researchers in all sorts of subject areas – from Anglo-Saxon literature to local genealogy, 17th century medicine and medieval land ownership – but something of a daunting prospect for an undergraduate and for anyone (i.e. me!) trying to put together a brief summary of the collections. 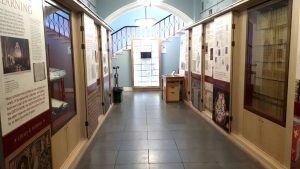 The L&A staff were as helpful and knowledgeable as always, however, and with their help I managed to find a handful of broad themes that represented the main bulk of the collections while appealing to student interests. From there it wasn’t difficult to find examples from both the Library and Archive collections to illustrate the wide range of topics represented in the collections. 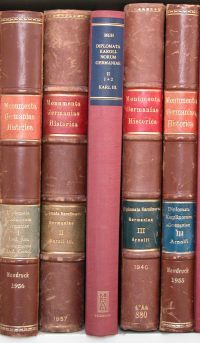 Famous volumes such as the Exeter Book (a unique collection of Anglo-Saxon poetry) and Exon Domesday (a rare survival of local data collected for the Domesday book) were obvious choices, but other types of sources such as photographs, newspaper cuttings, and even the books and Cathedral buildings in themselves, as records of historical craft techniques and heritage conservation, also provide a vast supply of research opportunities. 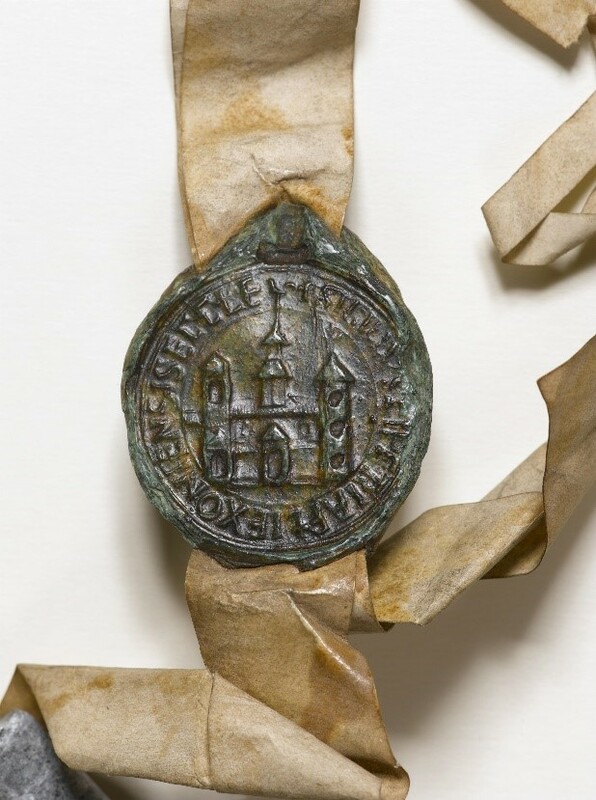 Many sources are also sadly under-investigated and could benefit considerably from research being done on them – the wax seals of bishops, monarchs and dignitaries from around the country attached to early charters being a particularly promising example. I also made an effort to emphasise that there really might be something for everyone at the Cathedral and to highlight sources that people might not expect. Students primarily interested in international history might assume there was little for them, but when the library includes a whole range of bibles translated into Native American languages, relics of 19th century Christian missionary efforts, who knows what other research topics the collections can cater to? To combat the misconception that all historical material is dry and boring, I also included my favourite group of Cathedral sources, the Chapter Act books. 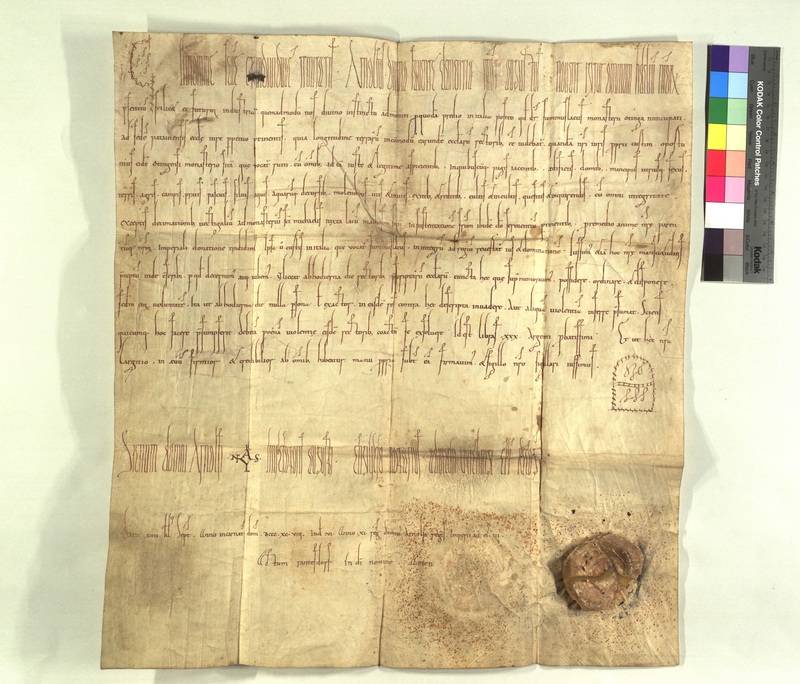 Kept continuously from 1385 to the present day, these record Cathedral decisions and payments, often in minute detail. 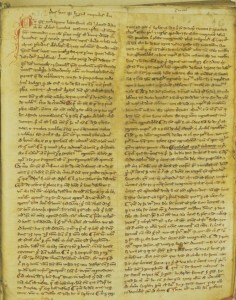 The records vividly illustrate life in the past in all its wonderful mundanity, from the orders of new hymn sheets and repairs to almshouses to the misbehaviour of choristers and organists – such as the fines given to Richard Dickinson, bellringer, who ‘through his own fault’ managed to break some of the Cathedral windows during a funeral in 1619. 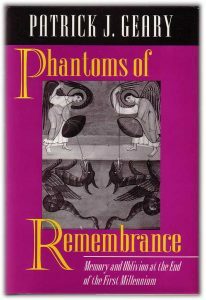 As I began my research it became clear that not only was there entirely too much material to create anything more than a very brief guide, but also that introducing students to the process of researching in the Library and Archives was just as important as giving an insight into the collections themselves. Having volunteered there in the past, I was familiar with the peaceful location behind the Cathedral, the wall displays in the entrance hall interpreting the history of the Library and Archives and some of its treasures, and the quiet, book-lined reading room, but introducing it for other students has helped me to appreciate it in a new light. I suddenly noticed features like the wheelchair ramp and the browsing mode of the online catalogue, as well as all the potential research opportunities that appeared when I started looking at them from the perspective of other researchers coming for the first time. Describing the process of making an enquiry and trying to emphasise how welcoming and knowledgeable the staff are has made me realize how lucky we are as Exeter students and residents to have such an amazing resource freely available to all of us and right on our doorstep. I hope that the guide will make the Library and Archives’ material more widely used by Exeter students. There is a huge amount of material that could not only really enhance student’s work, but also would benefit from more attention and research work done with it. 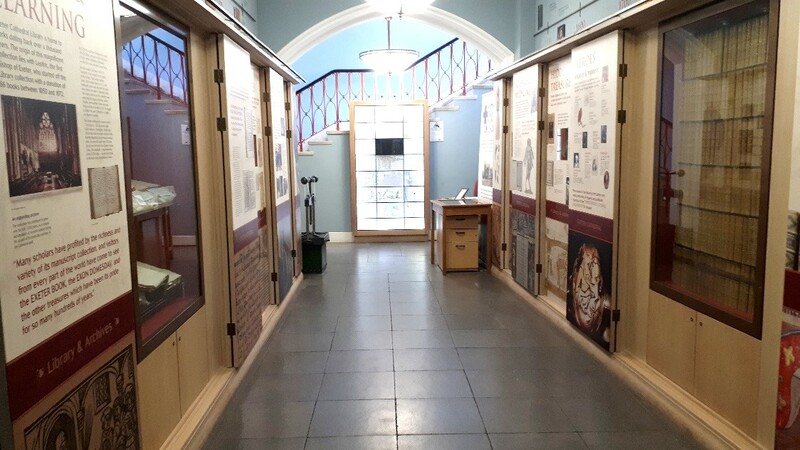 There is so much to be gained on both sides and both I and the Library and Archives’ staff would be delighted if even a handful of students turned their interest and expertise to these collections. This has been an extremely rewarding project for me, and I hope it continues to be of value to others for the years to come.